Great insights @JBord and completely agree with @CJKatl. Actually, from everything you've described, if price is close, you'd probably be happiest at the Ren and/or Soi 57 properties. The Ren is in the same neighborhood as the CY but closer to both the BTS station (very close) and restaurants/bars. The Soi 57 property is in a less touristy neighborhood close to the BTS and has many suites similar to the Marquis, allowing for upgrades and good views. Both have nice lounges. If the price is good, you should add the JW to your list, provided the renovations go well. Yeah likely the Ren for sure. Great location. Soi 57 seems a little far away from most of the touristy things. Anyway, I just wanted to provide some notes on the two I tried with the hope that the detail helps someone else. Since you are so close to the BTS, the Soi 57 isn't far from anything. Being a little away though makes the neighborhood less touristy. You get a better sense of the local life. IMHO, the Marquis is farther from everything and the Soi 57 property is more connected. I like the Marquis a little better than the Soi 57 property, but the Soi 57's location actually makes it my top choice. Sorry to have not mentioned it earlier but your insights are appreciated. There are such good choices in Bangkok. Hopefully each person can read the many reviews and determine which property is right for him/her. No choice is bad, which makes it even harder to choose which is right for a specific person/stay/issue. Re-reading my response, it may have looked like I thought you were picking on my summary, but I knew you were not! But you're right, this is exactly why I posted my two experiences. When I was deciding, I read probably 100's of posts stating the Marquis was the best Marriott (or whatever hotel someone loved). But I didn't read a lot in terms of comparing the key features and benefits, at least not in one easy to find place. Just because someone loved the Marquis might mean they usually get upgraded to a big suite, and that is more important to them than location or breakfast, for example. And as a measly Gold (until the end of December anyway, then Plat! ), things like lounges are more important to me than unlikely upgrades or Platinum arrival gifts, so I try to provide that point of view which I believe is different than a Platinum. With all the great Marriott properties in Bangkok, I think it would be really helpful for more people to post facts on key amenities at each property. Consider this a formal encouragement of such behavior! It did not come across that way at all. I was just trying to correct my bad form in not thanking you. Your insights are appreciated, detailed, useful and in no way taken as negative. I will be in Bangkok in a couple of weeks and might try to stop by to see renovations at the JW. Perhaps they would show me a room. On that same trip I'm considering springing for the Grand Marquis Suite at the Marquis for a few days, just for the heck of it. Unfortunately the room category between M Suite and Grand Marquis is still not available to book (I toured one of these unicorn suites in person, but for whatever reason it's not being offered for sale yet). As of today (December 4,2017) they are still not prepared to show any of the refurbished rooms, but they do have this mock up in the main bar area near check in. When I asked when the rooms will be ready the reply was "later this month". CJKatl and barracuda93 like this. A further update on the renovations at the JW. The mock up that was in the bar has now been removed (maybe because Christmas decorations???). The rooms being renovated are on the 8th, 9th and 10th floors. The target date for completion of work is December 15th. I might get the chance to see a room next week. Which Cat 5 hotel to choose? I realize that this thread is nothing but opinions about the Bangkok hotels, but I wanted to see if someone can give me a suggestion to a specific choice. I'll be staying for a week with the family, and I already have a Cat 5 certificate. So I have to choose between the 3 options. I am gold, so we're supposed to get the free breakfast. The things I most care about are nice breakfast in the restaurant (not lounge), best chance for a suite upgrade, good stuff at a lounge in the evening, and ease of getting to various tourist attractions. The Renaissance is looking pretty good for all that. Or would one of the 2 Marriotts be better? The Ren generally does not allow free breakfast in the restaurant for Plats, let alone Golds. The restaurant breakfast is excellent, but very expensive, like $60+ a person on the weekends, and full with locals. The only time I've gotten breakfast in the restaurant is when the hotel was empty because of the government protests a couple years ago so they stopped serving breakfast in the lounge. When I've asked since I've been told no, which is an unusual word at this hotel. Given there was one of me and I was PP or Plat at the time (two different stays) breakfast with the family for a week with seems doubtful. IIRC the FS allows families breakfast in the restaurant because they don't want the kids in the lounge, but I'm not 100% sure of that. You do realize that a Bangkok lounge breakfast is a far cry from an American lounge breakfast, and includes made to order eggs, noodles and many different entrees, right? And breakfast is limited to the Gold member and one guest. Kids are not automatically included as free extras. Hopefully others will know which of the Bangkok hotels allow the kids as extras for free, if any. In the Ren and the FS the lounges are small and get crowded, so they carefully check that people are eligible to use the lounge. As for good stuff in the lounge in the evening, I'm not sure how old your kids are, but I think all of the hotels strictly follow a rule to toss kids out of the lounge at five o'clock. It's in the Welcome Letter. I've seen kids being told to leave and never seen kids in any of the lounges in the evening. Putting that to the side, each of the lounges is pretty equal in the evening offerings. ADDED: A Bangkok FS representative posted on TA that kids are excluded from the lounge from 5:30 pm. I believe that age to be sixteen and below, but it might be higher. All the Bangkok hotels follow the same rule on this. As to where to stay, lets have an honest moment. If you're going to Bangkok for partying and women, you'll want to stay somewhere along Sukhumvit. It depends on your budget and service preferences. While Sukhumvit has two of the most famous areas targeted at non-rich westerners out of three, there is a completely different market (more Asian-targeted and overall more upscale) along Rachada – around and up from the MRT Huay Kwang station. There are still other less known areas, on Phetchaburi to airport direction (similar to Huay Kwang, but cheaper and lower quality), somewhere around BTS Ari (Thai-targeted gogos) etc. The world is not limited by Nana Plaza LOL. I'm going to respectfully disagree about staying on the river. I did stay at the Marriott there back in the day, now the Anantara, and found the transportation to be clumsy and time consuming. Absolutely, that area is the worse to stay in Bangkok. Actually I do find the whole of Silom end to be a pain to stay at. Weird that so many nice properties are in that dead end. 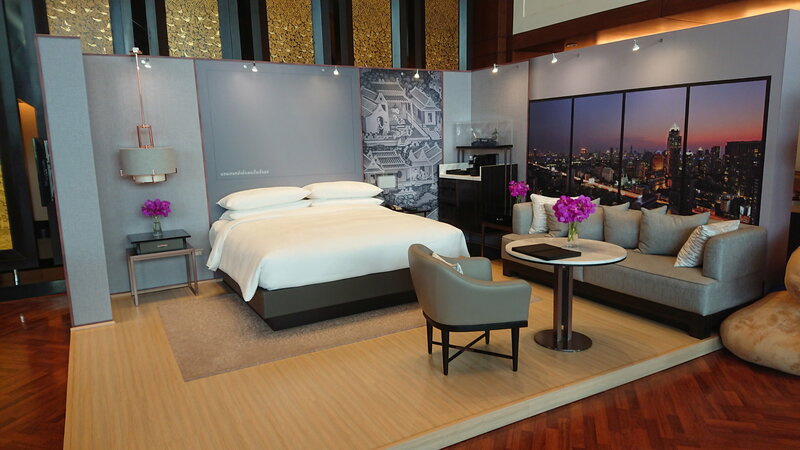 Having SPG / Marriott properties on the Rama 9 side would be fantastic, but there are none. So Sukhumvit is a second choice convenience-wise. But, there are NO tourist attractions on Sukhumvit (outside of nightlife and malls). Sukhumvit suits those who like to partake in its wares. The River is popular for a reason. One of them is its distance from "The Suk" It's a more historical area, adjacent to other older neighborhoods. Transportation by transit/River is plentiful. But road travel is messy. It's especially messy getting back to Sukhumvit. But, it's a snap to get to the Skytrain, the MRT, and the river boats. Yes, and no. To me, the value of staying in the Sukhumvit area was the easy access to two BTS lines, one that takes you right to a major pier on the river, as well as the MRT, and yet being able to walk to good food and shopping. In my opinion, I'd rather travel around during the day, but stay closer to my hotel at night for dinner, drinks, nightlife. But it probably depends on what your interests are and how you like to travel too, so to each his own. Diplomatico and happygolucky_nomad like this.